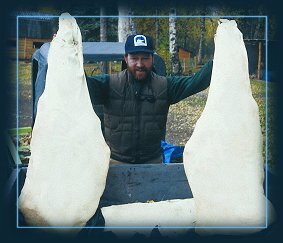 Small sized 48" quarter bags from Alaska Game Bags. Conveniently rolled for packability and easy usage. Breathable, virtually tear-resistant, odor free and reusable. Alaska hunters face some unique challenges in getting their meat from the field to the freezer. 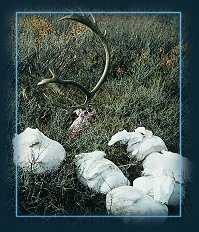 Adverse weather, delays in transport, insects, and marauding predators are some of the more well known factors that contribute to lost or poor quality game meat. Hunter/entrepreneur Earl Rinio used other game bag products for years without satisfaction before deciding to develop his own game bags that were species specific and ideally suited for Alaska's extreme environment. After consulting with big game guides across Alaska and conducting numerous field trials, Rinio has come up with a unique product designed to meet the exacting needs of the Alaska hunter, as well as hunters around the world. The first step in developing a superior game bag was finding the right material. A stronger, lighter, more durable material was necessary. Different sizes were needed to accommodate the large range of animals taken. Strong and lightweight materials were tested; different shape and size bags were evaluated on everything from sheep and blacktail deer to giant bull moose. The result is a line of superior game bags that are super tough, lightweight, durable and tailored to specific animals. Alaska Game Bags can come in compact rolls, are breathable, virtually tear resistant, odor free and can be reused. In addition, to allow hunters and guides the opportunity to custom make their own game bags, Rinio also sells bulk rolls of his material to the public. He also provides detailed instruction on how to best use his products in the field. Transporting your meat from the kill site to your home can be a challenge. It's not easy to keep bugs, dirt, adverse weather and predators away from fresh meat. size each bag 8" X 48"
The solution is the Alaska Game Bag - a product designed to be stronger and more durable than the average game bag. Alaska Transport Bag 24" X 30"